Honestly I had a lot of hesitations about this book that kept me from picking it up for a long time. The cover looked cheesy. The story of a cyborg Cinderella did not really excite me. But this series was hyped so much and has gotten so many good reviews that I was convinced to give it a try after all. And overall it was okay. It is not perfect and it is not immediately an all-time favorite, but it got me invested in the characters and interested in the rest of the series. 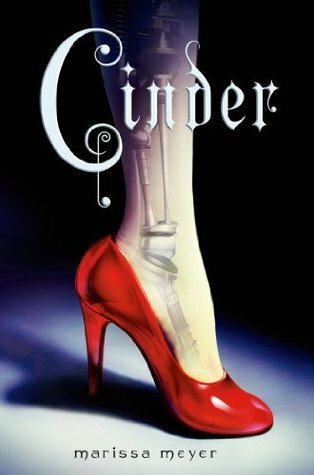 The premise of the Cyborg Cinderella that did not interest me at first actually really did pleasantly surprise me, though it did take me a few chapters to get into it. It’s actually a very original and daring move and I am excited to see how Marissa Meyer handles the Red Riding Hood, Rapunzel and Snow White retellings in the next few books. I was also pleasantly surprised by the main characters and the romance. I was expecting Cinder to be boring and well… kind of robotic and unemotional, but she was a lovely main character. She was smart and funny and brave and I grew to really like her. Prince Kai was a perfect Prince Charming and I love that the romance was still somewhat realistic and not overwhelming to the story. The secondary characters are also great. I loved Iko and Dr Erland, they were hilarious. I also loved to hate the bad guys: the evil Stepmother and Stepsister and the evil Queen Levana. The world was intriguing though a bit shallowly explained. I hope the next few books go a bit more in depth about everything. I especially would like to learn more about the Lunars. The ending did completely annoy me. Nothing really wrapped up, there are still so many questions and you are practically being forced to get the next books if you want answers. I usually prefer it if each book in a serie can still be read and enjoyed separately but that is not the case here. Nevertheless it is too late now. I am invested in the story and the characters and I need the rest of the story!